AED and Hemorrhage Kit Loaner Program – Tri-State Ambulance provides high-performance emergency medical services to Wisconsin, Minnesota, and Iowa. What is the AED and Hemorrhage kit loaner program? 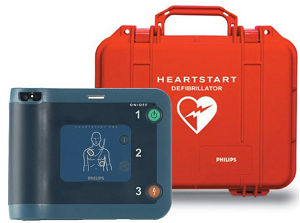 Our AED and Hemmorhage Kit loaner program allows the general public to “check-out” an automated external defibrillator (AED) and a bag containing multiple hemorrhage control kits for group events within our eight county service area. Initiated at Tri-State Ambulance in 2009, the AED and Hemorrhage Kit loaner program has allowed these items to be taken to more than 50 events with a combined attendance of over 150,000 people. At least one life has already been saved with one of hour loaner AED’s thanks to a community member who chose to take advantage of this free program. Research has shown that victims of cardiac arrest have the best chance of survival when CPR is initiated and an AED is made available within fie minutes of onset. The goal of Tri-State Ambulance and this program is to work with our partner communities to help save lives. We’re excited to say that this program is very successful in helping us achieve that goal. What kind of event is the AED and Hemorrhage kit loaner program designed for? The AED and Hemorrhage kit loaner program is designed for community and family events that do no have easy access to this equipment. How do I Obtain an AED and / or Hemorrhage Kit for my Event? All events that wish to acquire an AED and / or Hemmorhage kit must designate one person to be responsible for the equipment. There is no cost to borrow a loaner AED or Hemorrhage kit but we must have a credit card on file for the group or borrower to insure the equipment is safely returned. The loaner equipment may be obtained by any group located within the Gundersen Tri-State Ambulance or Tri-State Regional Ambulance service areas. Possession of the equipment will occur upon completion of the release forms. The equipment must be returned within one week of the release date.